The AT Armor RAC is a full featured releasable armor carrier that accepts our standard BALCS IIIA AT29 or AT11 Level II armor panels or any other standard BALCS cut on the market. 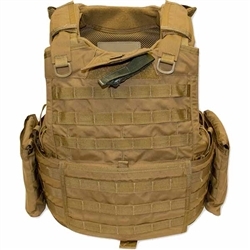 It offers a high-protection, quick-release design, and it is compatible with a full offering of accessories such as ballistic collar, bicep protection, groin protection, MOLLE pouches, and weapon slings (not included). . Accepts optional front, rear, and side hard armor plates.